Yes, my husband was awake! 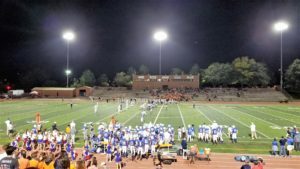 Our recent trip to Colorado was highlighted by a high school football game, which, I have to say, is miles apart from a pro game. Better miles. And, no, the Sparrow Brothers Fine School of Football Forecasting did not bet on this game. So, yeah, we won. But more on that later. We love to visit our family in the Denver suburbs and especially loved seeing the trees begin to turn and just a hint of fall in the air. A small hint, since most days were in the mid-80’s but it still beat the muggy warmth of Scottsdale. Denver, as you may have read, is a booming city. So much so that they have now adopted an anti-California attitude that stems from all the Golden State refugees that have flooded the housing and job markets. Like in all other instances, the Californicators have driven up both wages and housing prices which has resulted in a bit of resentment from the native Coloradans. But the growth has also spurred the resurgence of downtown Denver into a bustling place filled with great restaurants, new office and condo buildings and entertainment centers. No place better exemplifies that than Union Station. Once forgotten in the age of suburbs and cars, Union Station’s 100 year-old building was remodeled and extended in 2014. It is now the hub for Denver’s light rail, Amtrak, the city bus service and even Uber. Its magnificent interior gives one the feeling of being in a mid-twentieth century train station, complete with dark wooden benches, elegant chandeliers and soaring marble columns. 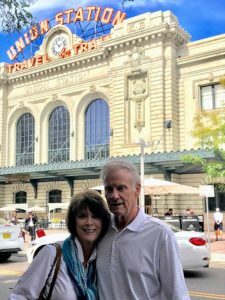 Yet from this nostalgic setting one can easily walk to Coors Field to catch at Rockies game or to Pepsi Center to watch a concert, the Nuggets or the Avalanche. Even Mile High Stadium is only a 15 minute drive away. The restaurants in the area are plentiful and good. Union Station is also home to one of the last remnants of civilization – the Tattered Cover Book Store. 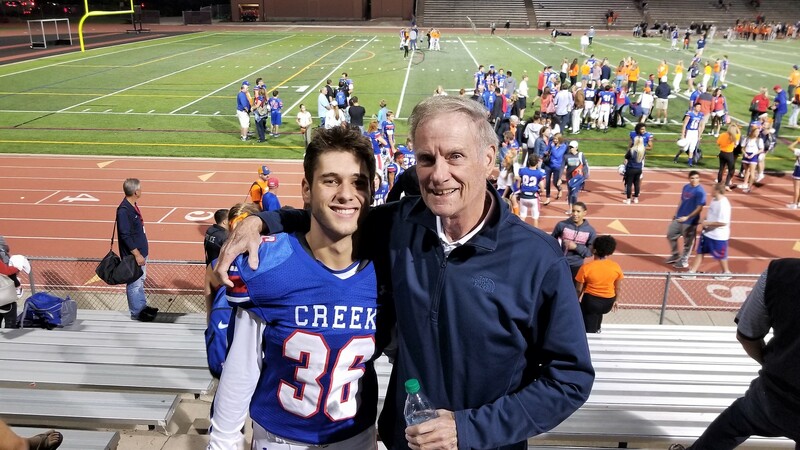 But our real reason for coming to Colorado in September was to watch our grandson in a high school football game. He is a senior this year so this was our last chance to see him in uniform. His team, Cherry Creek, is ranked #102 in the nation and thus far are undefeated on the season. Their quarterback, Alex Padilla, has already signed at University of Iowa and is someone to watch. I haven’t attended a high school football game since the 1980’s and I had forgotten what a magical experience it is. Wooden benches, parents volunteering to staff the concession stand, cheerleaders, the marching band, and my favorite, the baton twirler. Right off I was struck by the differences between high school football and college/pro games. First, no one kneeled during the national anthem. Second, the fans sit on different sides of the field. This is huge. It means that you don’t have some yahoo from the opposing team yelling in your ear or taunting your team’s every dropped pass or missed field goal. Third, there is no alcohol on the premises (except that smuggled in by weary parents or clever students). So in addition to not having the opponent’s greatest fan next to you, he is also not burping or throwing up all over you. The bright lights, the youthful enthusiasm and a big win (49-7 and it wasn’t that close) made for a evening we’ll never forget. But mostly, we’ll never forget how excited our grandson was to make a few plays and relish a big win. We know that it was important to him to play because we were visiting. Frankly, we didn’t care. We just wanted to see him on the team, enjoying the camaraderie of his fellow athletes and reveling, as only high school students can, in a huge victory. We walked away with a great feeling about the school, not only the football team, but the diversity of the cheerleaders, band members and pom girls. Everyone was encouraged to participate. It was a long way from the old days when only the most popular kids got to partake in that fun. To add an even more poignant meaning to the night, all of the kids were wearing orange shirts or ribbons in tribute to one of the pom girls who is fighting leukemia. It was heart warming to see all the support she received from her peers. I read a lot of criticism about the “kids of today” but anyone who believes that will get an argument from me. What I experienced was a great group of kids – caring, fun and determined. I think we’re in good hands. What a wonderful story from a very proud G-Ma! Thanks, Judy! Yes – he’s a really special kid if I do say so myself!!! Love this Suzanne. I so agree that there is a lot of hope among our youth. There are still parents who demonstrate values through their own behavior, hold their kids accountable when they err, and let them fly and fall, safely when its time to experience life’s ups and downs. I have hope when i look in Erin’s eyes and watch her impact her world. Love to you. Heartwarming and much appreciated blog. Can we talk about what a handsome young man Matthew is! WOW. I agree! There is nothing better than seeing your gran, male or female play in a team sport. I love it! I guess that is why I stay in Michigan fall and back in May!!!! Anxious to see you. We need to walk with Dash and Ivy. Hayden and Princess sport park is great walking!!! Be back November1. S- How fabulous! Know the area, school and certainly appreciate the love Grands feel for their kiddos!